We made it everyone! 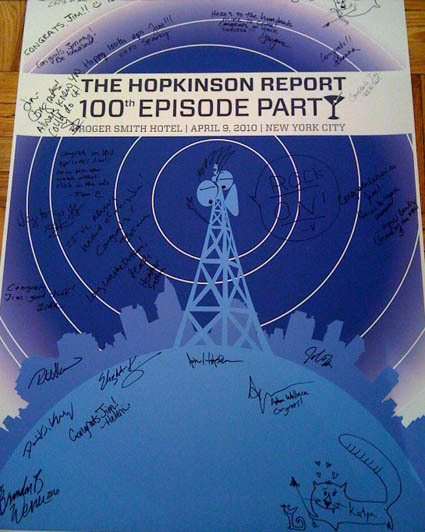 100 episodes! I’ll cover 10 lessons learned, the big party, and give some shoutouts. 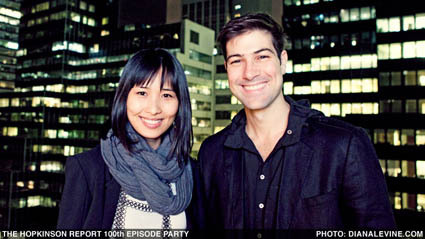 Wow, 100 episodes – pretty amazing. I’ve been at this for more than 2 years, week in, week out, whether I was tired or sick or excited, I carved out a little time to try and share some thoughts with you. Listen, I’m an oldest child, I’m a Leo, and obviously I like to hear myself talk. But I try to be aware of that and not get TOO full of myself. I realize this isn’t 21 seasons of the Simpsons or some of the other social media guys with millions of followers. It’s not the frontpage of the NY Times, the cover of Wired, and it’s not even a video podcast. Even 2010, some people don’t even know what a podcast IS. Still, it’s a fun accomplishment, and more importantly, I think it is symbolic of the time we live in. It might well be the defining characteristic of the last 10 years. You could create a podcast, and if you had some good ideas and strung them all together, you could build a little community for yourself. When I first started out, I wanted everything perfect. In fact, I probably waited an extra 3 months preparing, making sure every topic, icon, and piece of the website was working. What I’ve learned now is that it’s ok to let things go a little and publish, even if it’s at 90%. How important is it for me to stay up another 25 minutes on a Monday night removing every single “um” and “ah” from the show? Does that improve the show 5%? 20%? Do people notice? So do I still strive for perfection every week? Absolutely. That has to be the ultimate goal. I just don’t beat myself up if I don’t always hit it. This became a common theme. The more hours you spend at your desk, the more hours you spend online, the more hours you spend cuddling with your iPhone, the more important it is to truly connect with people IN REAL LIFE. The relationships come back around to you many times over. People often ask, how do I keep this going? Tuesday April 13 was a rare day, but I was up at 7am and went to the gym, went to a entrepreneurial breakfast event, worked for several hours, had lunch with a college friend, worked another 5 hours, went home and edited the podcast from 7-10pm, took a break and ate dinner, then worked on a side project from 10pm-3am. Crazy? Yes. But as long as you know when to roll with your energy, and when to let your body recover, you should do ok. I credit a lot of the energy I get to working out a 2-3 days per week, and running 2-3 days per week. Makes all the difference in the world. (see my podcast #89 on running). Anyone can start a blog, a podcast, a project, or a relationship. It’s being consistent once the initial fun part wears off. It’s not easy, but that’s when you can tell someone’s true dedication. (That being said, I’ll be honest in that it crossed my mind that #100 would be a good place to STOP for a little break). Face it, if you’re not doing something you’re passionate about, you might as well go home. This could not be a boring podcast about something I was marginally interested in. It had to be high energy and only about topics that got me fired up. This was harder to explain than I thought, but the analogy is across other areas. Musicians might not make money through music sales, but rather through concerts or touring. Authors might not get rich selling books, but can be paid doing speaking. And while I’m not getting paid specifically to podcast, I do it because I feel it’s a long-term commitment (personal branding, meeting new people, adding value to my day job, etc). Isn’t it great that blogs and podcasts and twitter let you vent? Be careful what you say, but don’t be afraid to say it. When you look back at your current job in 5 years, is there something you’ll be able to point to that will have stood the test of time? That you can be proud of? 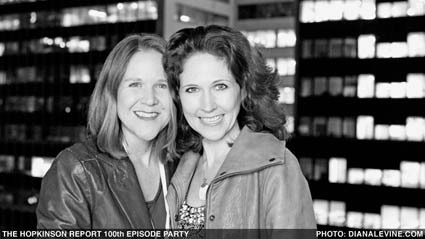 Getting to 100 episodes is less of a monumental accomplishment, and more about picking a date to kick off summer, pause and reflect, and spend time with friends. Take a moment to celebrate the little (and big) things in life. At this point in the post and podcast, if you want to jump off, fine. But Gary Vee talks about going above and beyond with customer service. So I’m taking the time to honestly say thank you to the people that have been along for the ride. 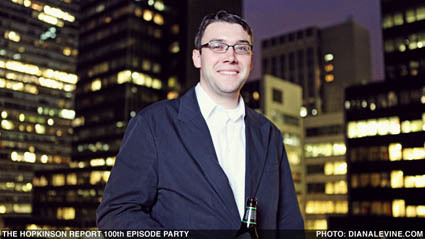 That’s why I personally emailed each and every person that came to my 100th episode party the very next morning. So check out the people below, and I’ll comment what special thing they brought to the show, or a funny story, who knows Jim best, what’s to come for 100+. Wired – Thanks to Wired for giving me the opportunity to do this, specifically Evan Hansen and Annaliza Savage. They’ve given me the freedom to conduct the show as I’ve seen fit. Rhonda Zapatka (left) – My friend Rhonda was one our party sponsors, and works at TrickleUp.org. Trickle Up helps ultra-poor people living in remote parts of India, West Africa and Central America to start or expand their own small businesses to improve their quality of life. Each year, Trickle Up helps start or expand 10,000 businesses around the world, over 90% of which are women-run. They are hosting two events in Manhattan: a gala affair at Cipriani Wall Street on Tuesday, April 20th, 2010 and a Young Professionals Council event on May 5, 2010. More info at TrickleUp.org. 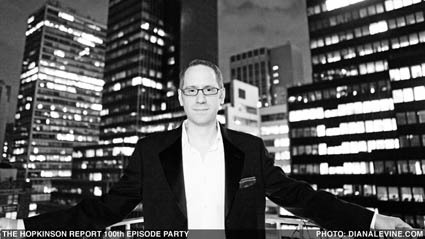 John Murch – My friend Johnny was our second sponsor, and runs a cool site called ublanket.com. Ublanket is a way to take old shirts, put them together online, and “upcycle” them – take one item and make it into something new. Renew, Reuse, and Rethread those meaningful shirts into a useful product. Jia and Federico – Sponsor #3 was Roomorama, an online marketplace for short term rentals. Use the service the next time you’re looking for a room for a few days while traveling, or if you have a spare room and are looking for an easy way to earn some cash. I profiled them on episode 26. Diana Levine (center) – Diana was gracious enough to be on hand to document the event. If you appreciate her photos and want to give a shoutout, go to dianalevine.com, or better yet, help support her walk for Parkinsons. She was on episode 95 and 96. Also thanks to good friends (l-r) Helen Todd, Brendan McManus, and Chris McCann (far right). 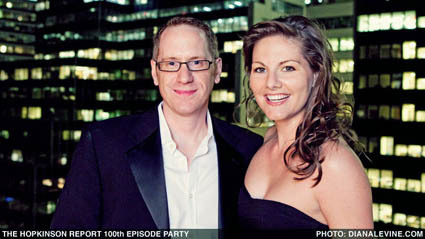 Mark Venezia and Jana Eggers (Spreadshirt) – Mark is VP of Marketing and you might remember CEO Jana from episode 78. You can see the 100th Episode episode shirt at condenast.spreadshirt.com (look at the first two items, then the back of the shirt). Use Spreadshirt coupon code WIRED100, and receive free shipping (first 100 orders only). Adam Wallace and Brian Simpson (Roger Smith Hotel) – Adam and Brian are two of the coolest people you’ll meet, and allowed me to host the party on their amazing rooftop. Read more about the Roger Smith Hotel and their take on social media in episode 79. Thanks to Naomi Less (the intro voice on the podcast), Bobby Shanes (episode 6), David FitzGerald (episode 7), Sarah Prevette (episode 59 and 99), Saul Colt (episode 41), Adam Carolla, and Bill Simmons (I call them podcast pioneers in episode 47). Elizabeth King – You’ll remember her as the Outsmarting the SAT author from episode 77. 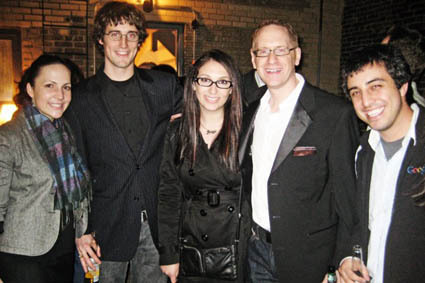 Brandon Werner – Brandon was proud to be intern 1.0, calling himself the buggy one that the early adopters got, before future interns Anuja, Juliann, Susi, and Kevin were upgraded. Brandon designed this blog, my business card, tshirt, and even a poster! His musings on design and geekdom can be found at Guns And Robots.com and The Modern Day Pirates.com. 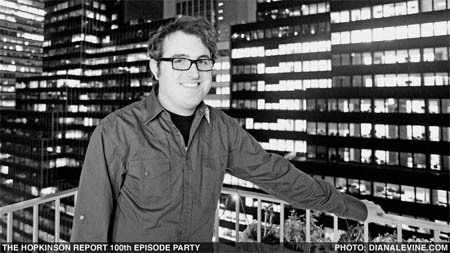 What’s up for Episode 101 and beyond? Most importantly, thank YOU, the reader and listener. This entry was posted on Thursday, April 15th, 2010 at 3:39 am and is filed under Branding / Advertising, Interviews, New York City, Pop Culture / Entertainment. You can follow any responses to this entry through the RSS 2.0 feed. Both comments and pings are currently closed.